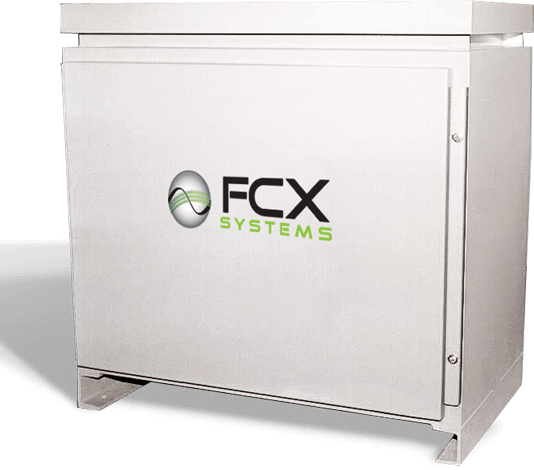 FCX: The world’s leading manufacturer of static (solid-state) frequency converters, diesel ground power (GPU), DC Power supplies and a source for pre-conditioned air (PCA) units. Product dependability, durability, ease of operation and sustainability are the hallmarks of all FCX products manufactured for the commercial, industrial, military and shore power markets worldwide. With a rigorous quality control program in place and ISO 9001:2008 certification, FCX products are renowned for reliability and longevity, many having been in continuous service for more than 25 years with little or no maintenance required. A full line of custom enclosures used for individual products, as well as, complete integrated systems are available. The FCXtreme Series X45 400Hz solid state frequency converter provides FCX Systems' rugged and reliable performance in a rating ideally suited for point of use applications. It's small footprint and low profile allows for easy integration into the hangar, flight line, or other environment. An optional 28VDC output with 200A rating offers enhanced capability to meet your power needs. RS232/485 communications interface, with optional RJ45 Ethernet or Wi-Fi connection capability. 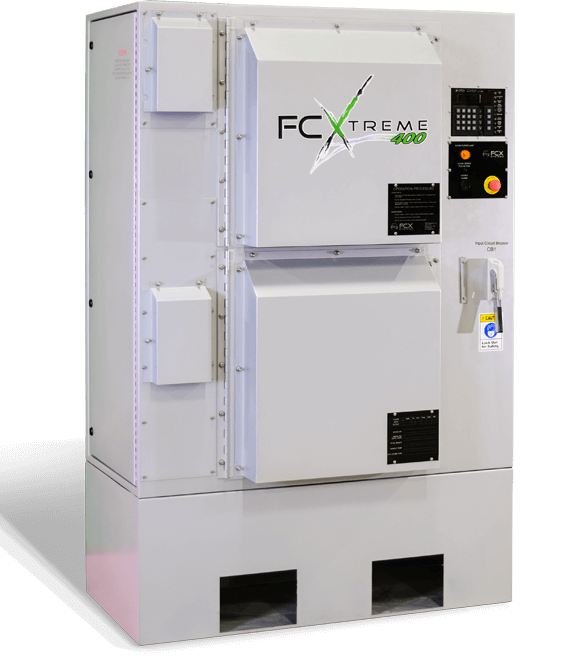 The FCXtreme Series provides reliable solid-state converters that are designed to provide 400Hz ground power with a small footprint in applications such as inside aircraft hangars, in electrical equipment rooms, or in maintenance shops. The FCX Shore power solution dramatically reduces ship emissions as well as noise and vibration from ships in port . . . at a lower operating and maintenance cost than motor generator sets or running the ship’s motors. FCX Systems Inc., a worldwide leader in solid-state 400Hz technology since 1987, continues to provide customers with state-of-the-art technology to meet the changing needs of the marketplace. 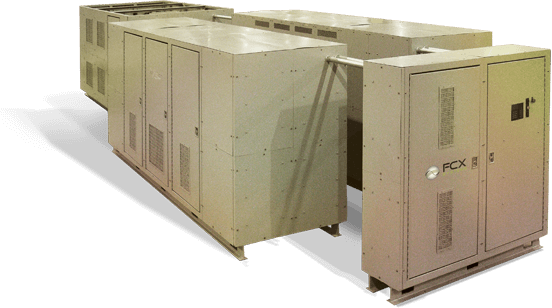 FCX Engineers have designed an economical, compact 312KVA solid-state frequency converter intended for direct genset replacement or which might be utilized in compact settings. This high performance unit is indoor rated, constructed to operate under the most extreme situations. The unit requires minimal space while offering easy front and rear access to the unit for simple servicing. FCX has achieved high performance and increased reliability by using laminated bus integrated inverter modules. The performance characteristics are enhanced by micro-processor controllers with field programmable logic. This advanced design has long made the FCX converter the top converter in the world. True RMS Design for precise voltage control of non-linear loads. The FCX Line Drop Compensator (LDC) is designed to cancel out the inductive voltage drop in 400Hz transmission lines. Voltage drop in the cables carrying 400 Hz power is much greater than if the same cable were carrying 60 Hz power. 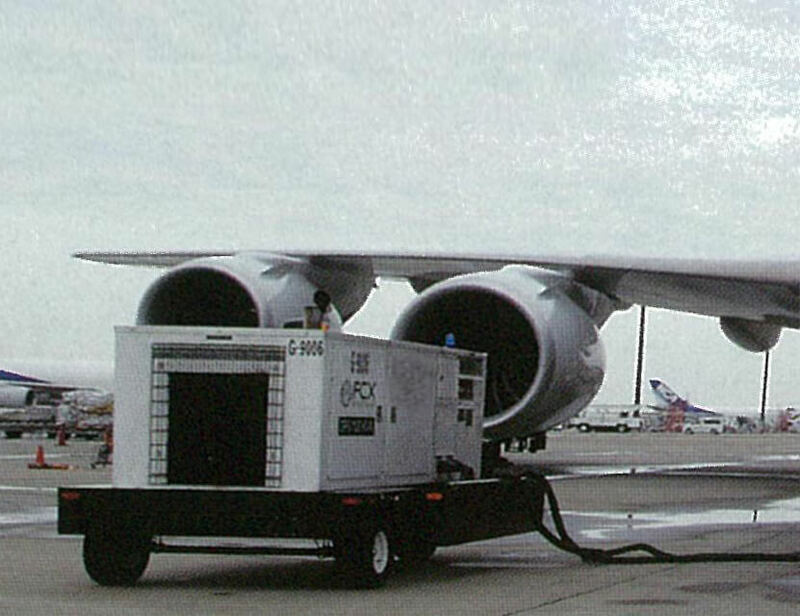 Left uncorrected, the aircraft may reject the power feed due to low voltage. The LDC is connected in series with the cable run to the 400Hz Service Point and improves voltage by cancelling out the voltage drop due to 400Hz AC reactance of the cable. The LDCs are available in ratings with up to 20% compensation capability. 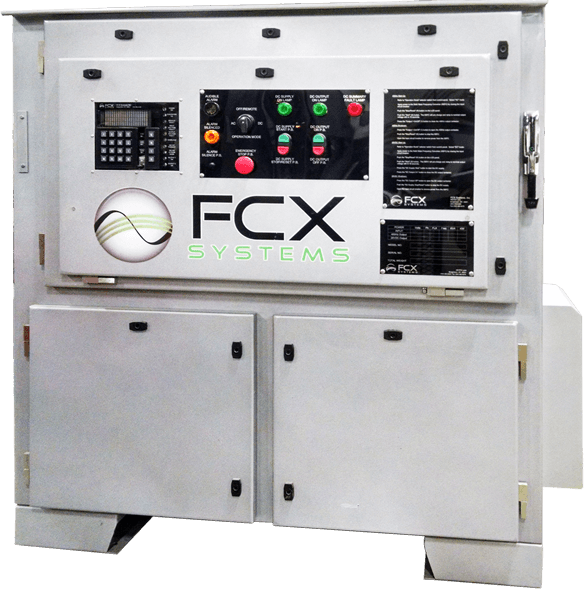 FCX Systems, Inc. designs and manufactures 60-180KVA diesel generated 400HZ power units built for rugged demand, high performance and ease of operation. The performance and flexibility of this design is unparalleled. FCX solid-state power supplies provide regulated 28.5VDC power with minimal noise. The power supplies are equipped with an adjustable current limiting feature for engine starting. Each model is designed with high power SCR modules to allow for precise control of the output voltage. The units also have soft start to allow the power supply to ramp to nominal output voltage. Power supplies are built in a mobile NEMA 3R equivalent enclosure for easy installation for interior and exterior environments. The performance of FCX Systems 270 VDC Power is flight line and production line proven - we are 270VDC from the ground up. Installation sites include main production and test sites, such as: Lockheed Martin F-35 Assembly in Fort Worth TX, Navy F-35 T&E NAS Patuxent River MD, and JSF ITF Facility at Edwards AFB CA. 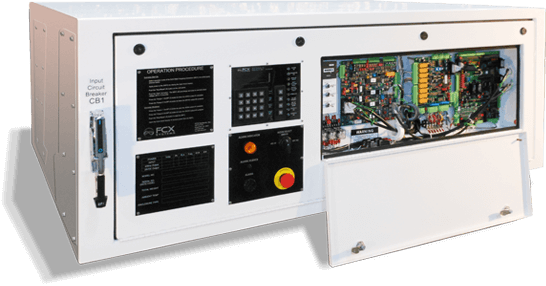 FCX Systems precision 270VDC equipment is the preferred and best power of choice for all 270VDC applications. Most experienced designer, manufacturer, and supporter of 270VDC ground power systems. 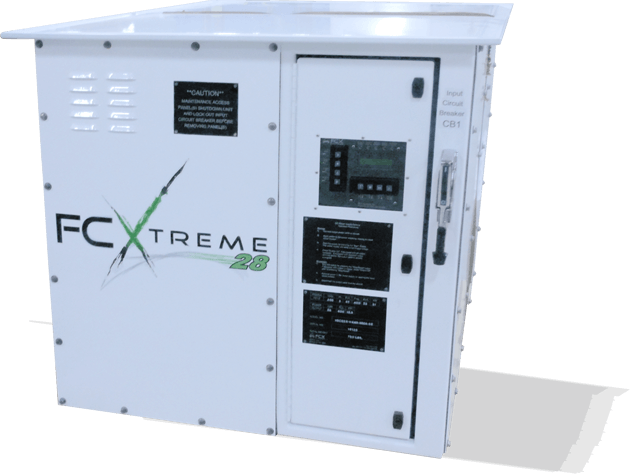 FCX offers 270VDC for every application, and can meet the high dynamic response required by the F-35 and F-22. Monitor and protect your aircraft and other sensitive loads from transients and abnormal power conditions. FCX 270VDC power delivers precise regulation, rapid response and recovery - built to perform, and to last. "It was a pleasure testing a product that easily met or exceeded all requirements and expectations." - Lockheed Martin F-22 Ground Power Qualification Test Manager. All units are equipped with a Variable Frequency Drive (VFD) to reduce blower speeds for substantial energy savings. The units are designed with optimal coil and compressor circuitry, which aids in lowering operating costs as well. Removable side panels allow interior access to the unit for easy maintenance. This feature averts the removal of the PCA unit from the boarding bridge for any maintenance activities, which results in a significant cost savings for long-term upkeep. Strategically placed vents offer industry-leading noise reduction. All units use R410-A refrigerant, widely considered to be the most environmentally friendly and efficient throughout the industry. To place an order for our PCA product line, contact sales@fcxinc.com or request a quote online. 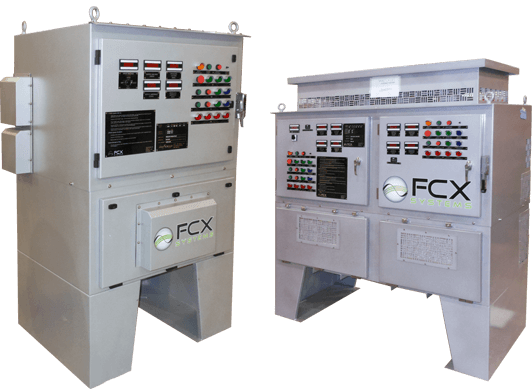 FCX custom-designs and custom-manufactures power conversions systems that meet–or exceed–end-user specifications for laboratory, industrial and environmental applications. On a daily basis, we put our drive and experience to work to solve new problems. 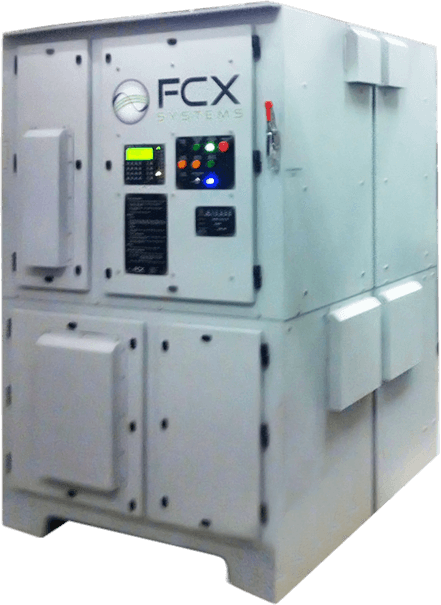 Meeting a project’s specialized needs–from small (30KVA) to large (2MVA+)–is a hallmark of FCX Systems’ approach to producing custom power conversion systems for our clients. With more than 150 years of power generation / frequency conversion expertise in-house, FCX Systems has the capacity to respond to inquiries anywhere in the world. This adds up to a level of performance in power conversion production that only FCX Systems can offer.